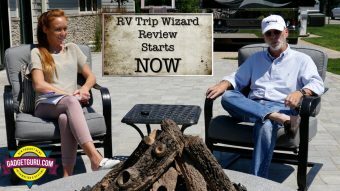 The video of Part 1 of the review of the RV Trip Wizard Program appears near the bottom of this post. While traveling in a recreational vehicle (RV) can be considered the ultimate way to see the USA, planning an extended trip, or even a weekend getaway can be a stressful experience. That’s because RV and motorhome sales have skyrocketed over the past decade, but available camping, parking and overnight spaces have failed to expand at even a fraction of the same pace. Unless a trip is planned well in advance, since campground demand has surpassed supply, securing reservations, especially in desirable, seasonal locations that offer enhanced recreational amenities and full utility hookups, can be difficult. Considering that one of the expectations of new owners of “recreational” vehicles is having the ability to get away on short notice, more times than not, disappointment sets in when having to settle for a less than desirable location. There’s no shortage of apps and online sites designed to aid in RV trip planning and that’s part of the problem…there’s simply too many of them. New users can easily become overwhelmed when attempting to decide which selections to trust and figuring out which sites offer accurate and current information. 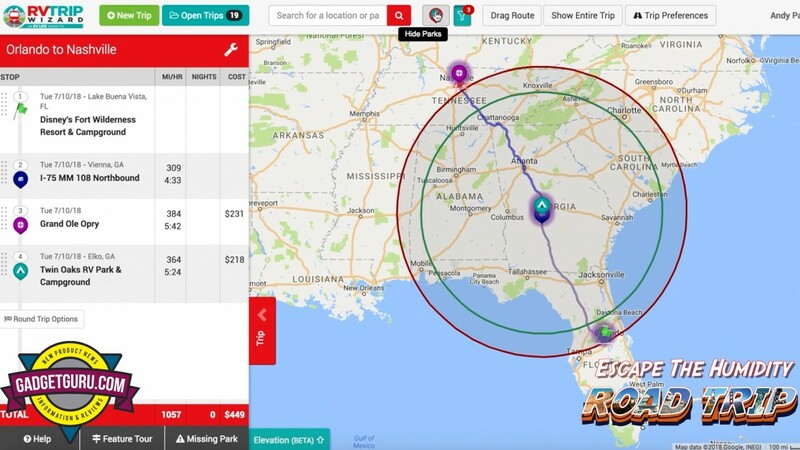 There’s apps that assist in route planning that can be custom tailored to the size and weight of your vehicle, there’s programs that can locate gas and diesel stations or dump sites, and there’s countless forums and Facebook groups populated by users who are more than willing to provide their experiences with specific campgrounds. With all this information, users, especially those who are new to traveling in a RV, can be easily intimidated. I’ll be the first to say that what works for me may not work for you. In my perfect world, I would like to go backwards in time and have a dedicated travel agent to assist in my motorhome trip planning needs. I would gladly pay for an annual membership or per trip fee to speak to a human being who understands the way I like to travel and to take care of all of the routing and trip planning details. 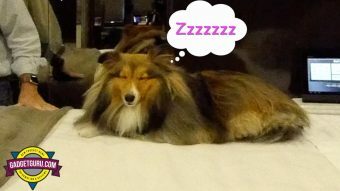 For example, if my travel preferences were kept on file and the agent could see at a glance the amount of miles I’m comfortable traveling per day, the type of campgrounds and resorts that I prefer as well as the size and weight restrictions of my motorhome, a single phone call could plan an entire trip. Even better, if a human being was involved, last minute changes could be made with a single call. Just like with any mode of travel, RVs have its share of challenges. Just like traveling by air, there can be mechanical or weather delays. Illness can mean the trip may have to be cancelled, postponed or restructured and set off a chain of events that require a long list of re-bookings. As an example, just a few years ago I booked an air, hotel and car rental through a travel agent. During the trip, I came down with a 48 hour bug. While convalescing in my hotel, a single phone call to the agent was all that was needed to make all the changes to my itinerary and I could focus on recovery and not having to remain on hold with three companies to rebook the itinerary. So far, I have yet to find a company that provides this type of service to motorhome owners and considering the sheer amount of RVers on the road today, I’m surprised that no one has yet to provide this type of service. However, if this service exists and I’m simply not aware of it, please contact me and I’ll do my best to give it a try and provide a review. Could RV Trip Wizard Be A Solution? Last year I took a brief look at the RV Trip Wizard online program and my initial thought was that it was a bit rough and didn’t spend too much time attempting to learn its interface. This year, as my travel departure date rapidly approaching, I decided to give it a much closer look and I must say that while it has much room for improvement, it’s impressive. For my test, while I had my destination reservation on the books, I had not yet planned my routing or my en route overnight stays. In a nutshell, RV Trip Wizard is an all-in-one RV trip planning program. 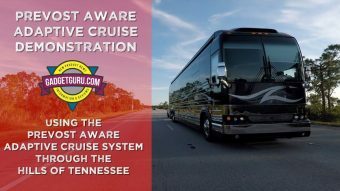 It allows you to enter the specifics of your RV, plan a route, select fuel and rest stops and peruse various campgrounds and points of interest along the route. What makes this program truly useful is that concentric circles appear on the map that designate your selected driving range. This allows you to select campgrounds within within a specific area. 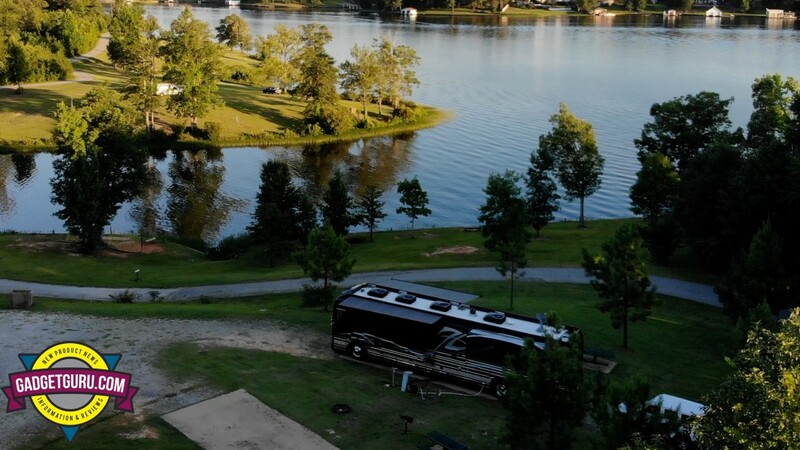 The database of campgrounds are linked to a section that is populated by user reviews from the RV Park Reviews website. This is an easy and efficient way to read current user reviews that are dated and rated to see if it’s a campground that offers the amenities you find desirable for an overnight or longer stay. 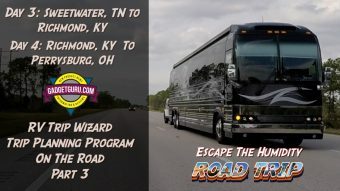 Since I’m not one to offer gloss-over reviews and prefer to take the time using a product or service before providing a recommendation, I decided to put RV Trip Wizard to the ultimate test and use it to plan a 1,400 mile, four-leg trip from Florida to Michigan. I’m calling this adventure The Gadget Guru’s Escape the Humidity Road Trip and hope you enjoy the series. My goal was that instead of just providing an opinion of the program’s on-screen interface and incorporated features, to actually use the data generated during the planning stage to see if it held true during the actual trip. 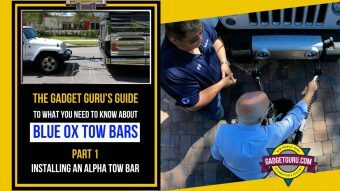 During this series you’ll experience the learning curve of using this program while traveling in a Prevost motorhome. Allow me to be clear in saying that RV Trip Wizard is not a GPS navigation program and is not a substitute for a dedicated RV GPS unit. At its current configuration, this program require an internet connection to utilize the features and since it stores your trips online, the functions cannot be accessed without a connection. This program is best described as a trip planner that combines features that can be found elsewhere in multiple locations and combines them in a single interface. Because it stores your past trips in its database, a simple login allows you to access the trips and plan future adventures on a computer browser or tablet. Allow me to state that based on my experience, this program requires a bit a patience and performs best with a computer browser. 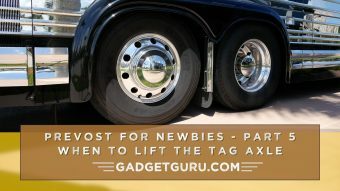 Below you’ll find the first of a five part video series that discusses using this program while traveling across the country along with some my findings in what could be considered, real time. A summary review and opinion will be detailed in the final installment. So as not to keep you in suspense, I’ll cut to the chase and say that I found the RV Trip Wizard program to be quite useful and the $39 per year subscription fee to be more than reasonable. While it’s not perfect and has room for improvement, I’m putting a buy rating on this product. While the interface is not what I would call intuitive, there are useful tutorials online that jump start usage. 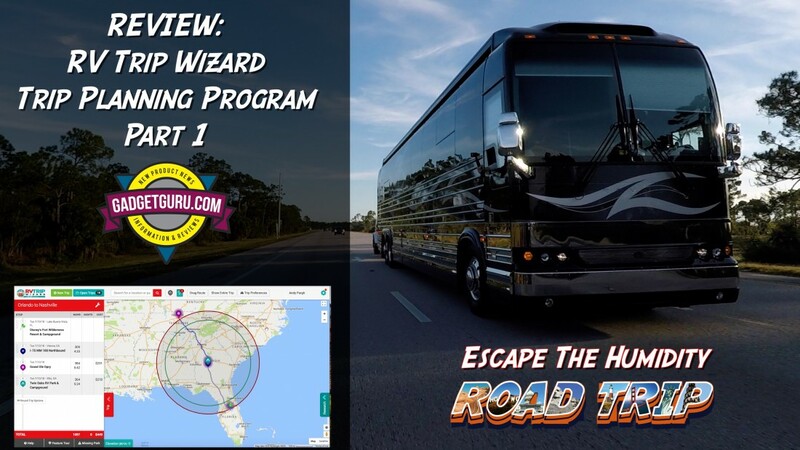 In my opinion RV Trip Wizard is the best all inclusive trip planning program on the market today and the company behind the program has shown they are working behind the scenes to provide updates and additional features. In this Road Trip video series, I’ll point out what I like and what needs improvement and I’ll state that no payment or consideration was provided for my review.